PRIME Minister Scott Morrison has described rugby player Israel Folau's latest social media attack on homosexuals as "terribly insensitive". 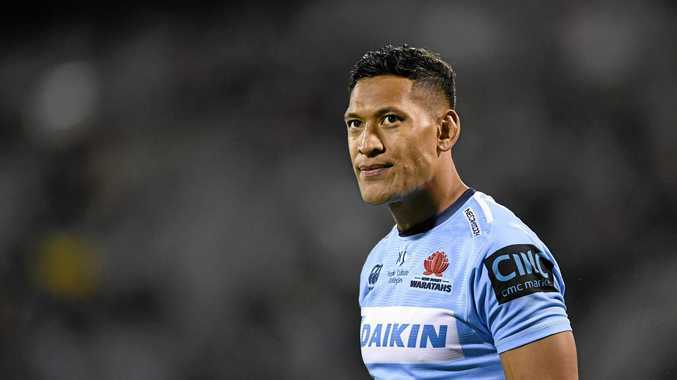 Rugby Australia has vowed to terminate Folau's multimillion-dollar contract unless he can explain his social media attack, and the NRL has ruled out welcoming him back to the code. Folau took to Instagram to proclaim hell awaits "drunks, homosexuals, adulterers, liars, fornicators, thieves, atheists and idolaters". Mr Morrison told ABC News on Friday: "I thought they were terribly insensitive comments and obviously that was a matter for the ARU and they've taken that decision. New Zealand Prime Minister Jacinda Ardern described Folau's comments as "damaging" from someone many considered to be a role model. "Obviously at a personal level I clearly don't agree with what he said, and (I'm) very mindful of the fact that he is for many a role model," she said. "He's a person in a position of influence and I think that with that comes responsibility. "I'm particularly mindful of young people who are members of our rainbow community - there is a lot of vulnerability there. As I say, I totally disagree with what he's said and the way he's using his platform. Hillsong pastor Brian Houston has reportedly deleted a Twitter comment where he also criticised Folau's social media comments. Houston tweeted that Folau's "way is not the right way", after the Wallabies star doubled down on his harmful rhetoric by sharing a meme informing the masses that hell awaited "drunks, homosexuals, adulterers, liars, fornicators, thieves, atheists and idolaters".